This is my review of the new Hyatt Centric hotel in Madrid. I needed a hotel for two nights in Madrid last week. There is no stand-out option in the city and cash rates are relatively low at this time of year which made using points look poor value. Anika disliked The Westin Palace when she was there, I wasn’t hugely keen on the Grand Melia Fenix and my two previous stays – Villa Real and Hotel Urban – were good but not so great I felt I had to rush back. I should say that Anika WAS exceptionally keen on the Gran Melia Palacio de los Duques. A couple of weeks ago I read an interview with the manager of the new Hyatt Centric in Madrid and liked the sound of it. The Gran Via location was super central, I have a preference for new hotels, it would tick off another Hyatt brand for their ‘Brand Explorer’ free night promo and I had two £60 Hyatt cashback credits on our American Express cards. The stars seemed to align. I booked the hotel for cash – this was not a review trip. I paid €340 per night for a Junior Suite, including breakfast and a guaranteed 4pm late check-out. This was clearly not a bargain but was offset by 2 x £60 Amex cashback credits and the fact that I would be spending much of my time working in the room. That’s a good question and I am still none the wiser! ‘Stylish boutique hotels’ is the phrase used on the Hyatt Centric website. This is a fair description – whilst youthful, they are not really aimed (or priced) at the Generation Z market. Madrid is marketed as a business hotel and I imagine a fair number of guests are 40-somethings like me who simpler prefer a modern design ethos. The hotel is a converted period office building so it also has a number of historic design features such as the staircase which runs through the property. Whilst it is trying to be cool by putting the reception desks in the bar, they don’t go far as to have thumping music anywhere. The rooms include desks, rarely seen in any hotel which thinks it wants to appeal to 25 year olds, and the in-room library had fairly high level art books. The ‘look’ doesn’t always work – I doubt anyone, aged 18-80, actually appreciates having the reception desk in the bar, but overall I liked it. Gran Via is essentially Oxford Street, but with a lot more hotels. Directly opposite Hyatt Centric is a huge Primark store. The majority of buildings are period and I enjoyed the view from my suite at night when many were subtly illuminated. It is half way between Gran Via and Callao metro stations. The area around McDonald’s outside Gran Via metro is the hub of Madrid street prostitution and was not the best place to arrive at 11.30pm. Callao does not have these issues. Annoyingly you need to change trains twice if coming in from the airport, and with quite long gaps between services on the Madrid metro you have a lot of hanging around to do. I was in Junior Suite 614. These are the curved rooms on the far left of the building as you look at the picture above. What you have is a lot of windows (with automated curtain closing luckily! ), a big bed (with Hyatt Centric Madrid cushions on it), a smart wooden floor …. …. a desk, a small selection of art books, a table with two chairs (and a free bottle of cava), a slightly annoying pillar painted silver …..
….. and a decent bathroom. There is shower with two heads (one rainfall) but no bathtub. Toiletries were from a brand called BeeKind which I didn’t recognise. There is a small walk-in wardrobe, not pictured. A Nespresso machine was also provided along with three cartons of water which were replaced daily. The desk only had one plug socket on it but, as I was travelling alone, it was fine. It didn’t feel immediately ‘homely’ at first, perhaps due to the pillar and wooden floor, but really grew on me during the 2nd day when I got to admire the view down Gran Via and the illuminated buildings in the evening. There is also a terrace on the roof, apparently, although I never made it up there. I enjoyed my two nights at the Hyatt Centric Madrid. The design ethos was in line with my tastes, although arguably it could just as easily have been a standard Grand Hyatt if it had a more formal reception area. I’m not sure how Andaz and Hyatt Centric are distinguished. Would I stay here again? Probably. It lacks a rooftop pool, unlike many Madrid hotels, but this wasn’t something I needed. The area around Gran Via metro is not exactly family friendly at night but you can avoid that by using Callao station. A hotel which did not require a change of metro from the airport would have been better but that is difficult if you want to be in the centre of town. Price-wise, it would have been toppy if I hadn’t had the Amex cashback credits. It was good to earn some World of Hyatt points but, without any current promotion, I only got back around 6% of my spend based on my 1p per point valuation. Take a look at the Hyatt Centric Madrid photos above and, if they feel in tune with what you like, I think you’ll enjoy it. The hotel website is here if you want to find out more. I think you mean ‘Callao’ instead of ‘Calleo’. Nice looking hotel, bonny building, loads more character than a new build. How hot was Madrid? Heard it was over 40C yesterday…. Me too! I heard parts of Spain might hit 47C this weekend! I think i will give it a miss for now…….! Rob – what do you think of the Intercontinental by comparison? It is obviously a much older property (the rooms are a bit tatty) but I’ve paid less than a EUR 100 and found the breakfast and service to be really good. We stayed at the Intercontinental last year; the food was okay in the club lounge however the hotel is very dated and needs a complete refit unless you like really dark rooms. The location is quite a distance from a lot of the tourist sites so we burnt a few calories along the way – there is public transport close by but I preferred to walk. My other half and I wouldn’t return to the Madrid IC; I am sure there would be better hotels which were less expensive in the city. Madrid is always boiling hot in August, that’s why all locals run away. September is much nicer. It was chillier than London last week! It isn’t just the locals who stay away, so August is the least expensive month for hotels in Madrid, and the museums are blissfully uncrowded. It also ends to cool down a bit later in August and at least it a dry heat. It suited us well last year. I think that’s really expensive for what you got. I’ve found much cheaper for a similar standard on Gran Via. My last Madrid stay was in a SLH hotel URSO. That was fab. Possibly a different way of earning Hyatt points in the future. 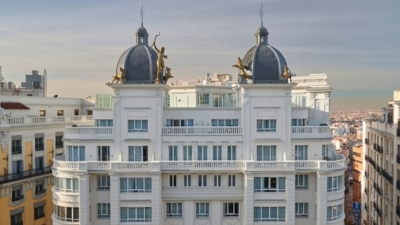 HELP PLS: looking for a top Madrid hotel with a nice roof top bar / restaurant to dine out for the evening. Fly in late avo and leave 24 hours later so looking for pure convenience. Any suggestions greatly appreciated. I know the Indigo (IHG) has a small rooftop pool. I was there a couple of weeks ago and the pool is on the roof, and is small. I wasn’t a fan of the rooms or breakfast and the staff all seemed to be in training, it was a bit chaotic. I wouldn’t return. ME Madrid has a great roof top bar. It’s also a great hotel. I have stayed 3 times and always excellent. Well located. +1 for ME Madrid. 10 mins from Sol metro, good bar and loads going on around it. I stayed at the Hyatt Centric New Orleans and Hyatt Centric Key West in July as part of family summer holiday. They were both excellent but didn’t appear to be from the same brand at all. I would say that Centric is lower tier Andaz. The toilet amenities in the HCs USA were bot BeeKind brand. Can you confirm your Amex credits have credited? Slightly oddly worded terms and I’ve not yet seen anything for my Hyatt Hamburg stay the other day (also paid in euro). On the Amex app, it says (on my Plat statement page) ‘Offer redeemed: Hyatt £60 back’ although the money itself has not yet appeared. The website statement doesn’t show this for some reason. Check out Hotel Urso next time. Granted no points earning opportunity but it is part of Mr and Mrs Smith got what’s that worth. Ten min walk down to Grand Via. Metro two mins. Boutique and stylish. We really liked it except slow bar service. We’ve just booked a last minute week away in Nerja, including a night in Madrid on the way back. £623 each covering a Hilton Gatwick night, biz class Gatwick to Malaga, apartment in Nerja for 7 nights, biz class Malaga to Madrid to LHR. We’re staying at the NH Alonso Martínez in Madrid, a short walk from Chueca. 100 tier points.